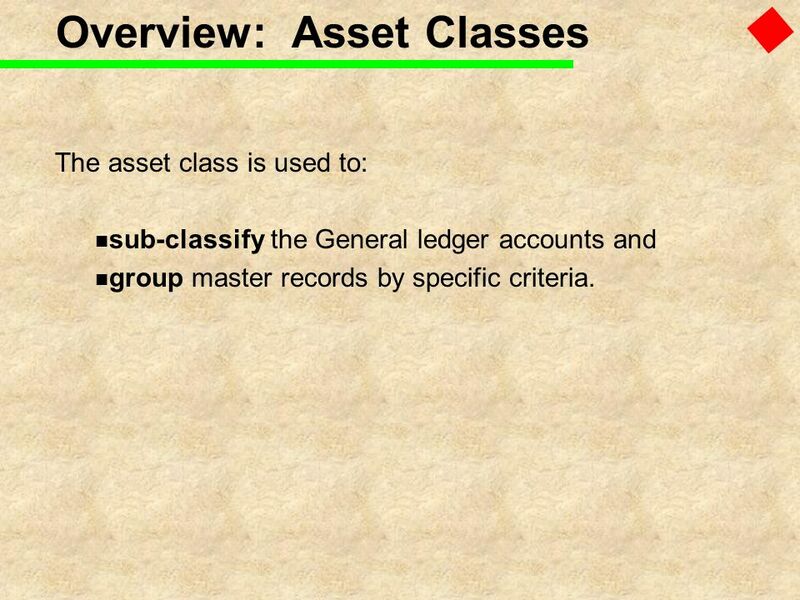 The asset class is used to: sub-classify the General ledger accounts and group master records by specific criteria. master records A	L Vehicles Fixtures and fittings Buildings Assets under construction The asset class is used to: sub-classify the General ledger accounts and group master records by specific criteria. 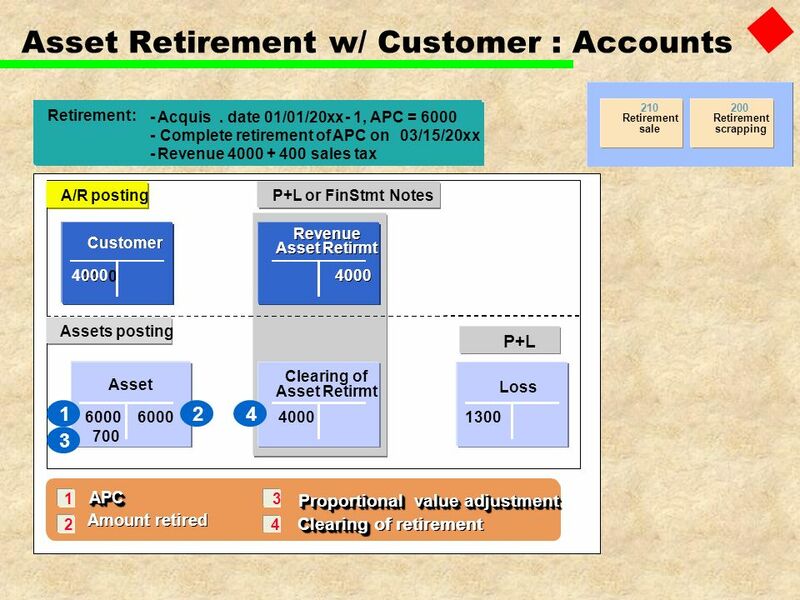 Account allocation Screen layout Number assignment Special features Default values Selection Assets Liabilities Asset portfolio Real estate Machinery Finance. assets Fixtures+fit. . . . Bal. sheet items Acct. determination Asset class Lathe Create asset Drill press 1 Assets The asset class contains default values and control elements which are passed on to the individual assets when you open a new asset master record. By entering useful default values, you reduce time and effort needed for creating new asset master records. You also ensure that the records in a given class are handled uniformly. The asset class contains default values and control elements which are passed on to the individual assets when you open a new asset master record. By entering useful default values, you reduce time and effort needed for creating new asset master records. You also ensure that the records in a given class are handled uniformly. 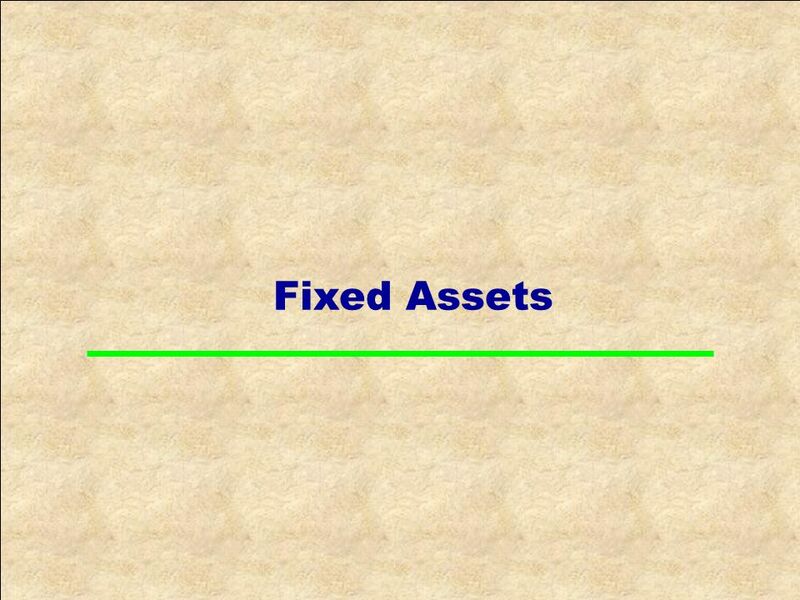 The asset class is the most important criteria for structuring fixed assets from an accounting point of view. Every asset has to be assigned to exactly one asset class. 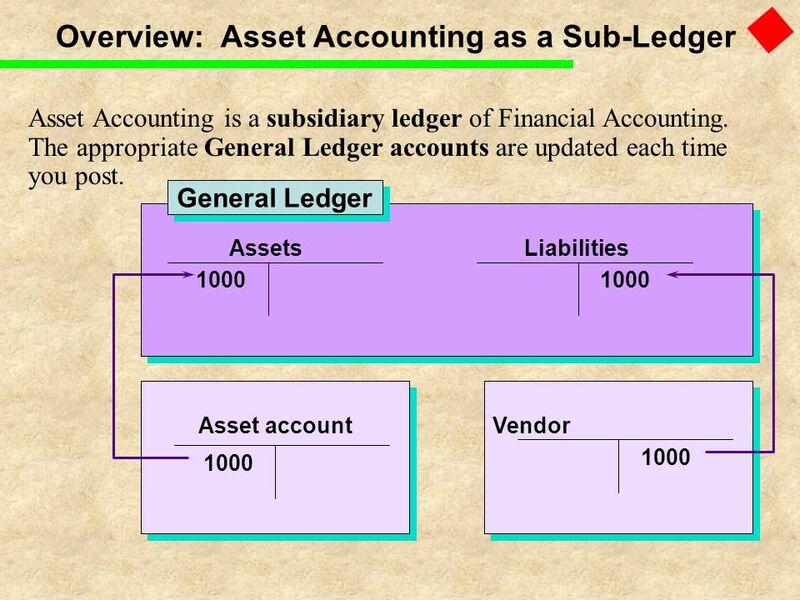 The asset class is used to assign the assets (and their business transactions) to the correct general ledger accounts. 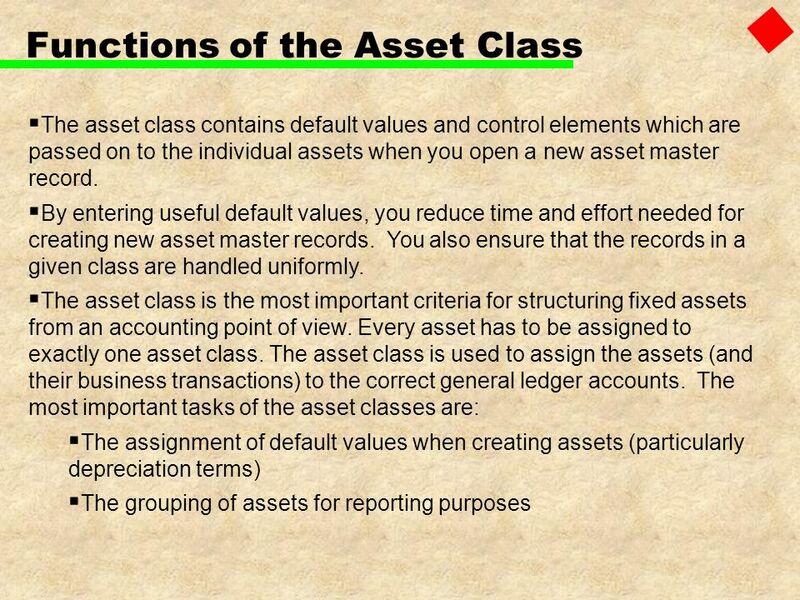 The most important tasks of the asset classes are: The assignment of default values when creating assets (particularly depreciation terms) The grouping of assets for reporting purposes The asset class contains default values and control elements which are passed on to the individual assets when you open a new asset master record. By entering useful default values, you reduce time and effort needed for creating new asset master records. You also ensure that the records in a given class are handled uniformly. Client level Account allocation Screen layout rule Number range Default values Chart of depreciation level Section for valuation data Selection of depreciation areas Master data section Asset classes Asset classes are made up of a master data section and a section for valuation data. You define the master data section of an asset class once on the client level. The valuation data section is dependent on the assigned chart of depreciation, which in turn is directly linked to the company code. Areas Depreciation key Proposed useful life Minimum Maximum Book dep. 10/00 _ DG30 decl-bal. 3 X Tax dep. SNFG invest. support Group 8/00 LINR str.-line 12/00 LINB ACRS . 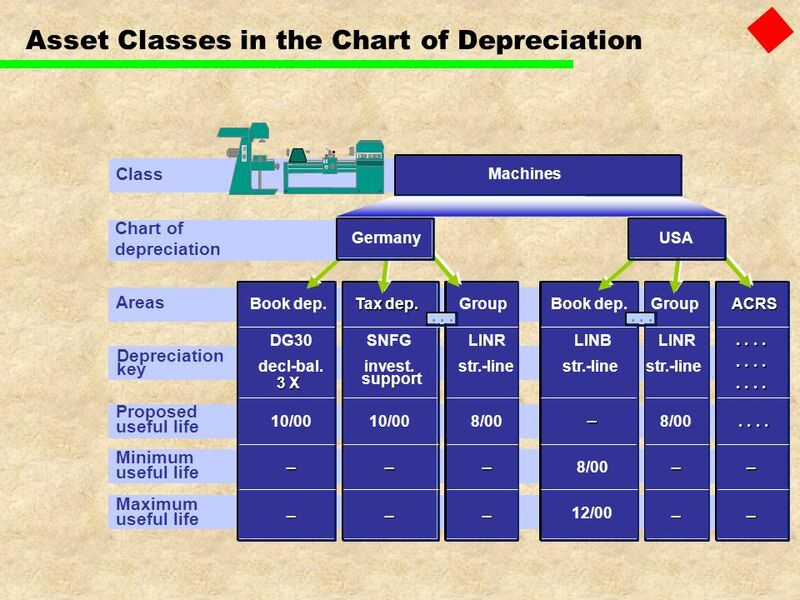 . . Class Chart of depreciation Machines USA Germany 1 You can define any number of asset classes in Customizing. 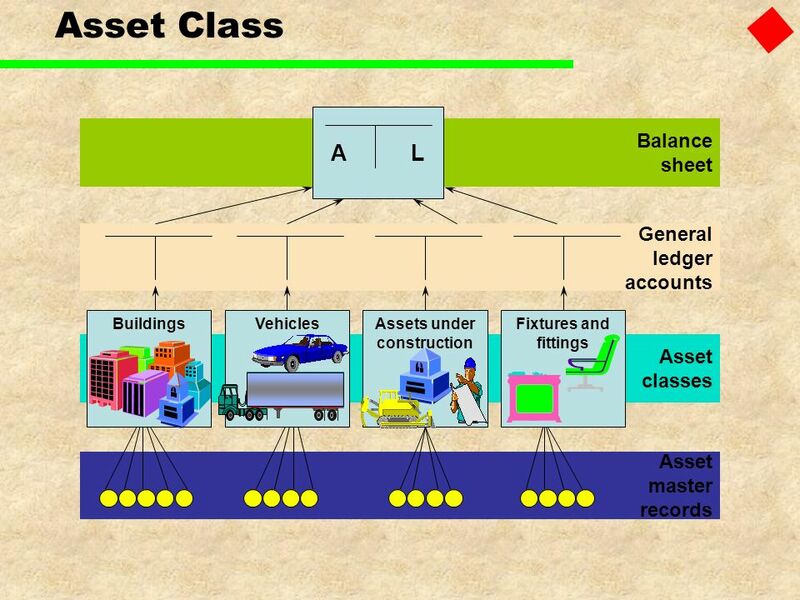 You use the asset classes to categorize assets according to the needs of your enterprise. The asset classes are valid across company codes. The catalog of asset classes, therefore, applies uniformly to all company codes. This is true, even if the company codes use different charts of depreciation, and therefore different depreciation areas You can assign different charts of depreciation to an asset class, so that all assets in this class will be treated differently in each country. 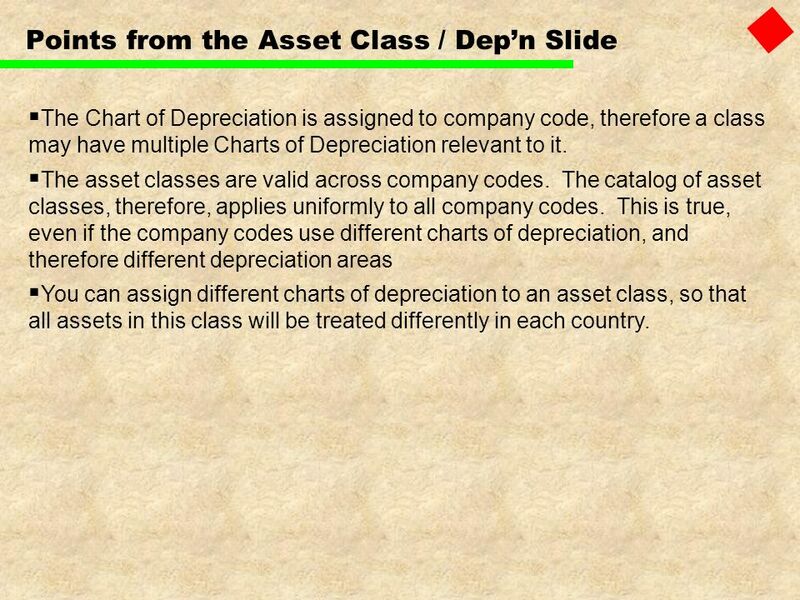 The Chart of Depreciation is assigned to company code, therefore a class may have multiple Charts of Depreciation relevant to it. The asset classes are valid across company codes. The catalog of asset classes, therefore, applies uniformly to all company codes. This is true, even if the company codes use different charts of depreciation, and therefore different depreciation areas You can assign different charts of depreciation to an asset class, so that all assets in this class will be treated differently in each country. 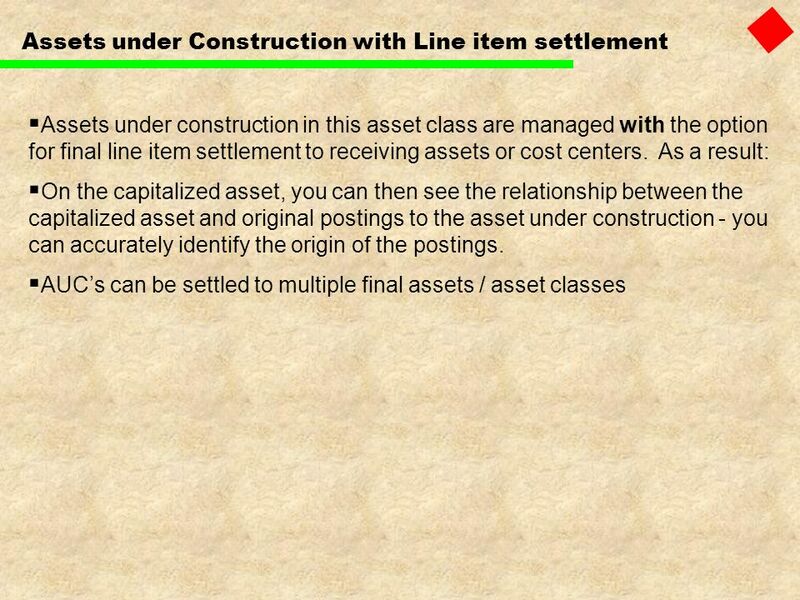 Assets under construction in this asset class are managed without the option of line-item final settlement to receiver assets or cost centers. 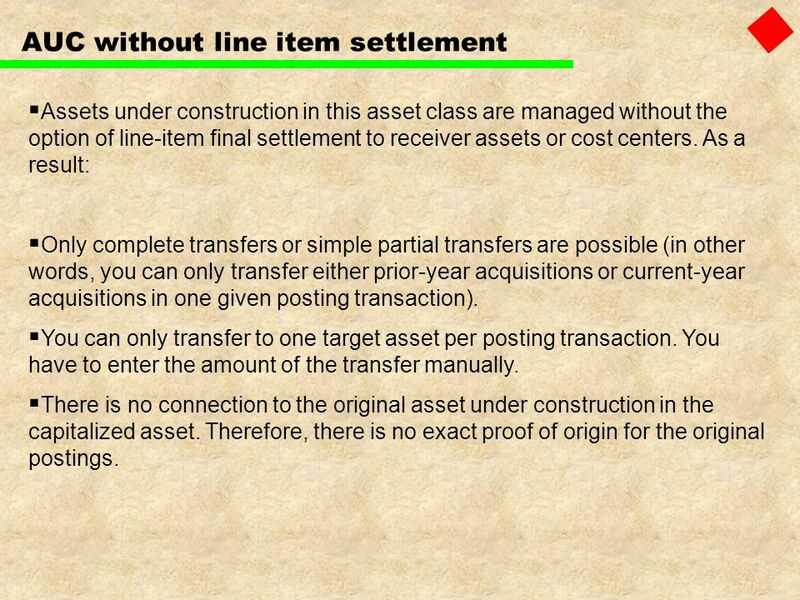 As a result: Only complete transfers or simple partial transfers are possible (in other words, you can only transfer either prior-year acquisitions or current-year acquisitions in one given posting transaction). 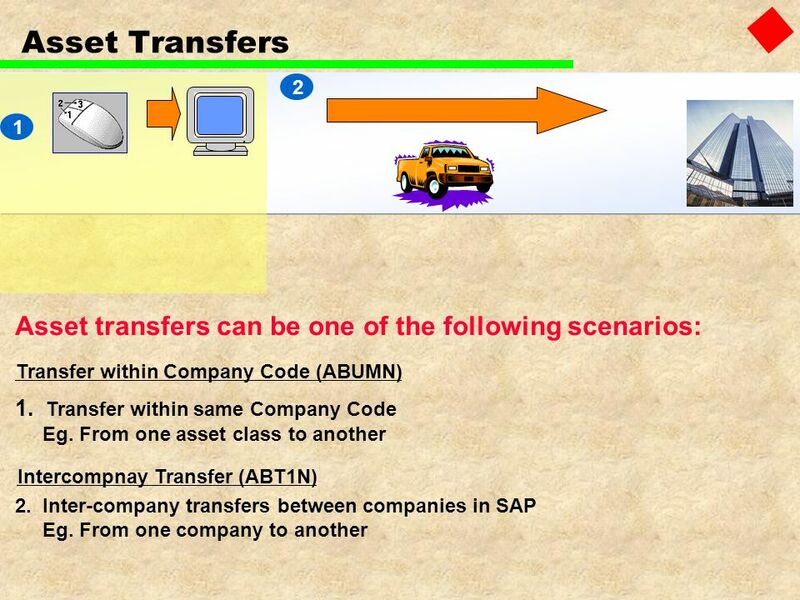 You can only transfer to one target asset per posting transaction. 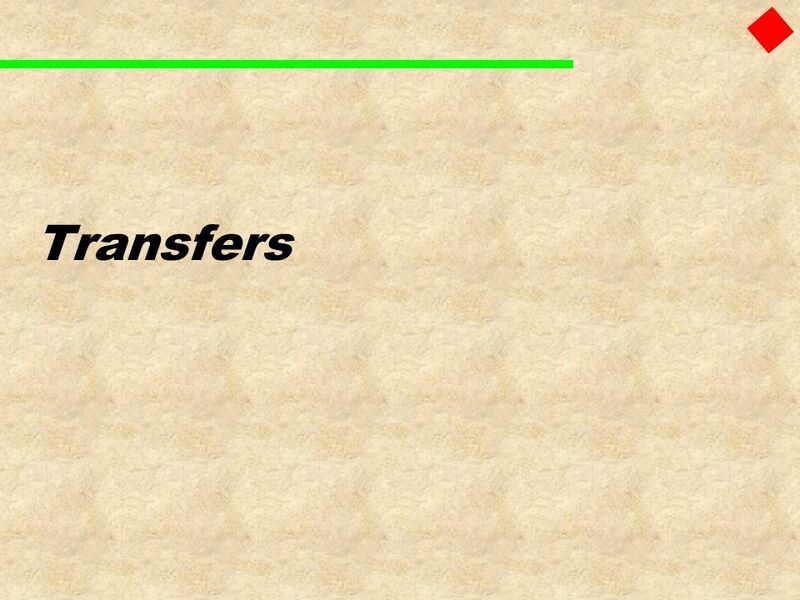 You have to enter the amount of the transfer manually. There is no connection to the original asset under construction in the capitalized asset. Therefore, there is no exact proof of origin for the original postings. Assets under construction in this asset class to be created solely for capital investment measures (internal orders or projects). 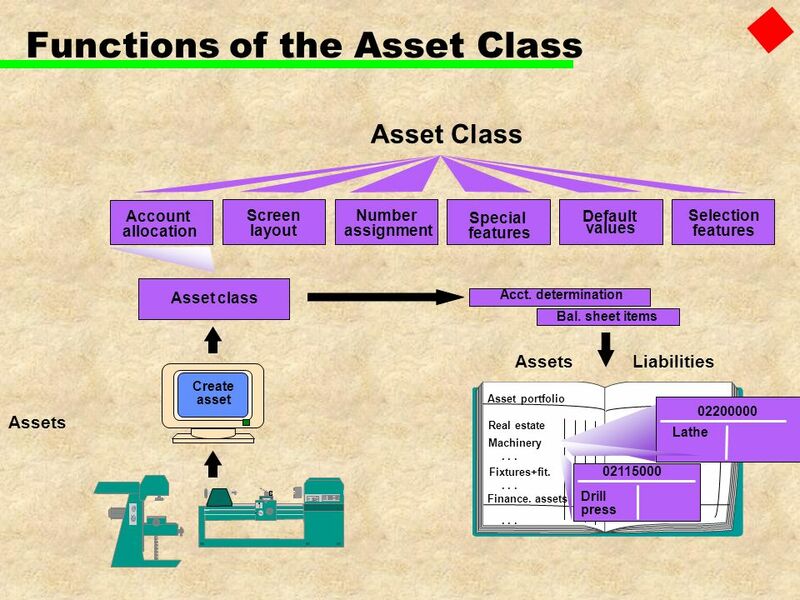 The assets in this class can not then be directly created and posted in Asset Accounting. 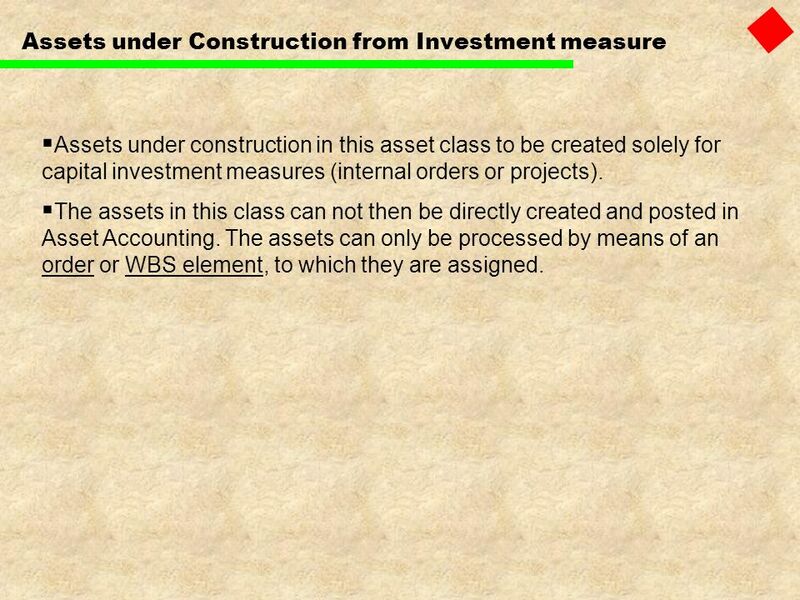 The assets can only be processed by means of an order or WBS element, to which they are assigned. Assets under construction require their own asset class. Choosing the depreciation key ‘0000’ ensures that depreciation is not calculated for the asset under construction in depreciation areas that are posted to the balance sheet. 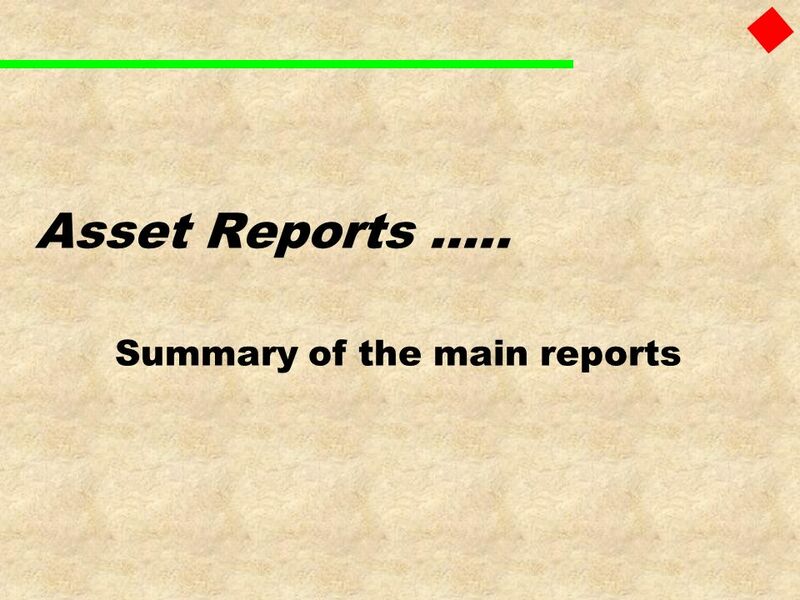 Assets under construction have to be shown separately in the balance sheet. The component IM (Investment Management) is available for managing more extensive asset investments from a controlling-oriented perspective. 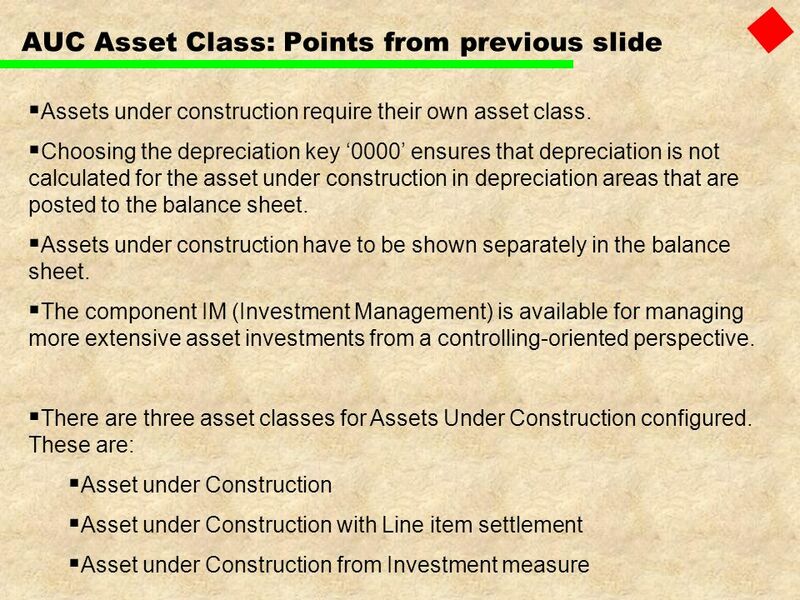 There are three asset classes for Assets Under Construction configured. These are: Asset under Construction Asset under Construction with Line item settlement Asset under Construction from Investment measure Assets under construction require their own asset class. Choosing the depreciation key ‘0000’ ensures that depreciation is not calculated for the asset under construction in depreciation areas that are posted to the balance sheet (in accordance with the legal requirements in most countries). However, special tax depreciation and investment support are possible even on uncompleted assets. 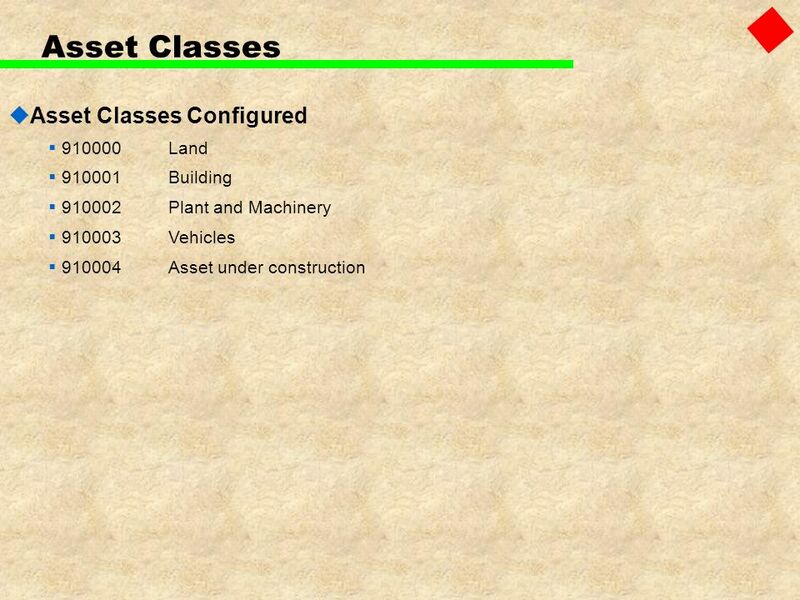 Assets under construction have to be shown separately in the balance sheet. It is possible to post down payments on assets under construction if you enter transaction type group 15. You can enter credit memos on the asset under construction after its complete capitalization, if you allow negative acquisition and production costs (APC). The component IM (Investment Management) is available for managing more extensive asset investments from a controlling-oriented perspective. You will generally need values for fixed assets for various business and legal purposes (for example, for book depreciation, cost-accounting depreciation and so on). In the R/3 FI-AA system, it is therefore possible to manage values in parallel in as many depreciation areas as you want. area 01 Book deprec. Depreciation area 02 Tax deprec. 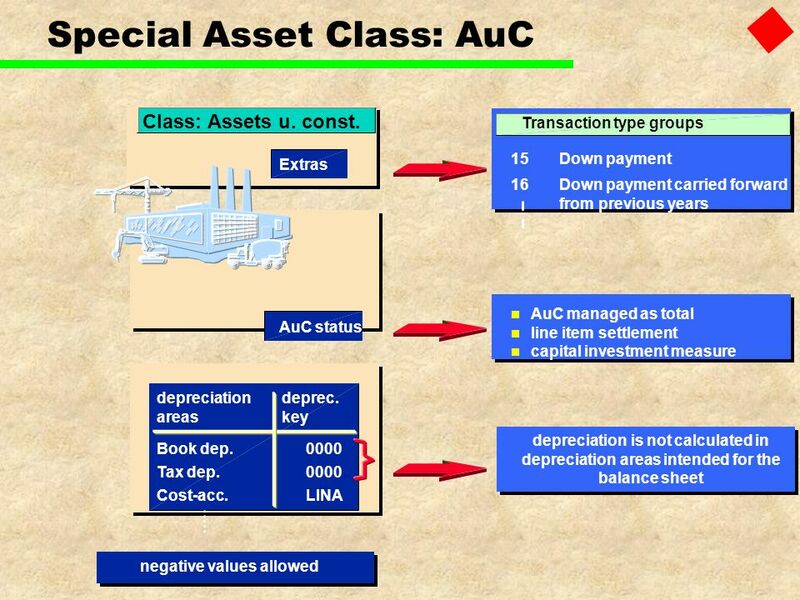 Depreciation area 03 Special reserves Depreciation area 20 Cost-acc. deprec. Depreciation area 30 Group deprec. You will generally need values for fixed assets for various business and legal purposes (for example, for book depreciation, cost-accounting depreciation and so on). In the R/3 FI-AA system, it is therefore possible to manage values in parallel in as many depreciation areas as you want. The chart of depreciation is therefore best described as a catalog of depreciation areas structured according to various business aspects. You can specify the characteristics and thereby the significance of the individual depreciation areas in each chart of depreciation. The country-specific charts of depreciation, which are supplied as standard, are for reference purposes only. 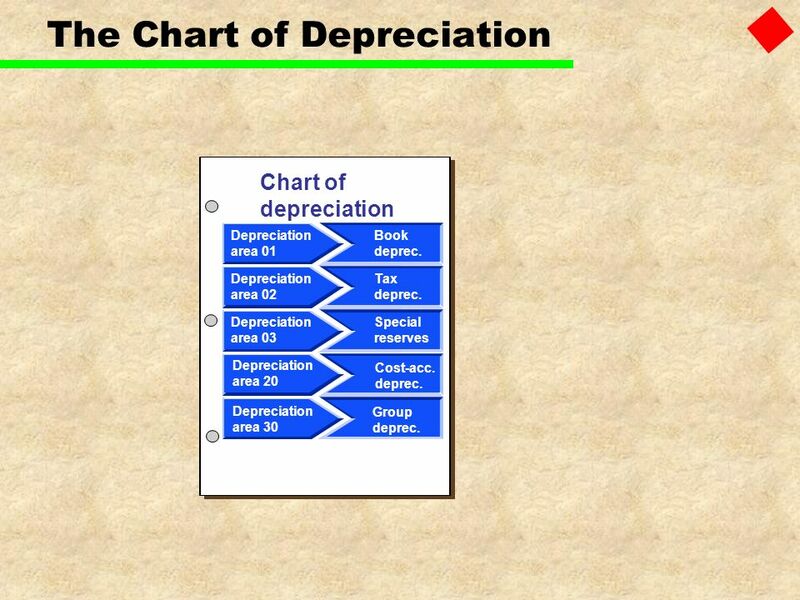 You can only open a new chart of depreciation by using an existing chart of depreciation as a reference. 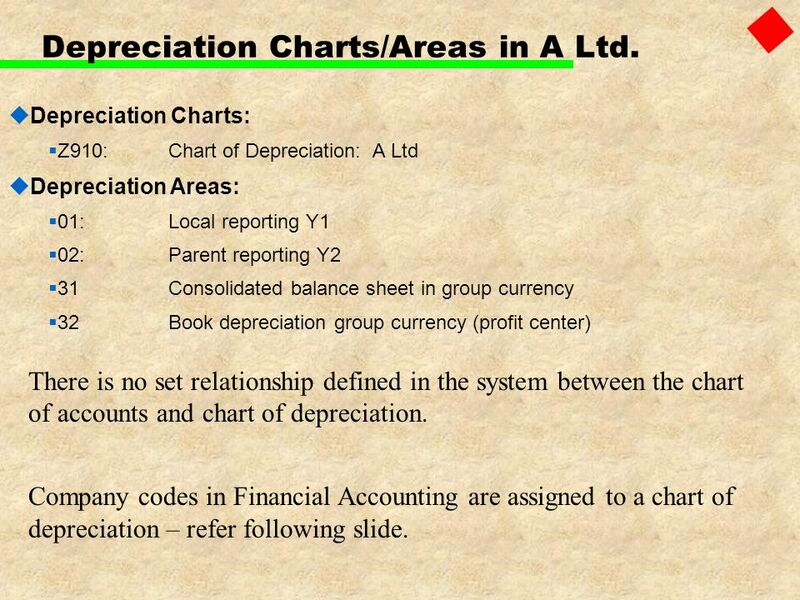 21 Depreciation Charts/Areas in A Ltd.
Z910:	Chart of Depreciation: A Ltd Depreciation Areas: 01:	Local reporting Y1 02:	Parent reporting Y2 31 Consolidated balance sheet in group currency 32	Book depreciation group currency (profit center) There is no set relationship defined in the system between the chart of accounts and chart of depreciation. 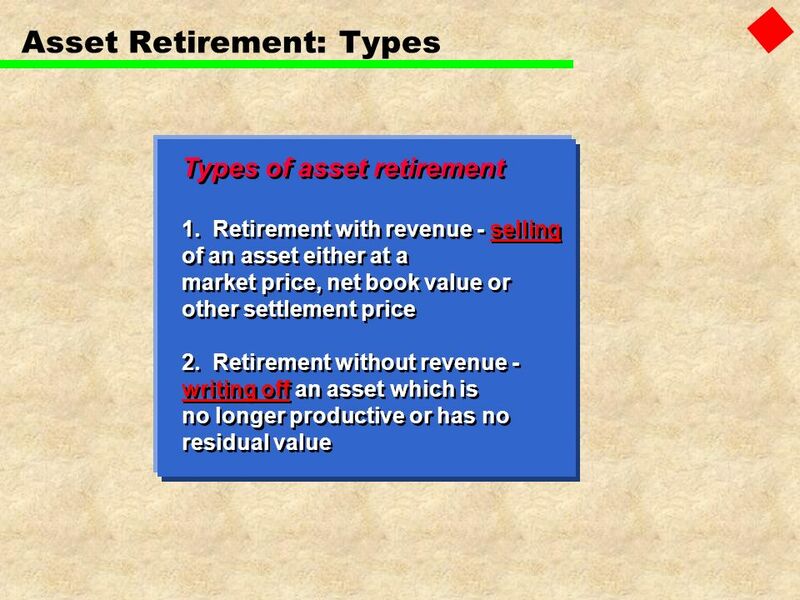 Company codes in Financial Accounting are assigned to a chart of depreciation – refer following slide. 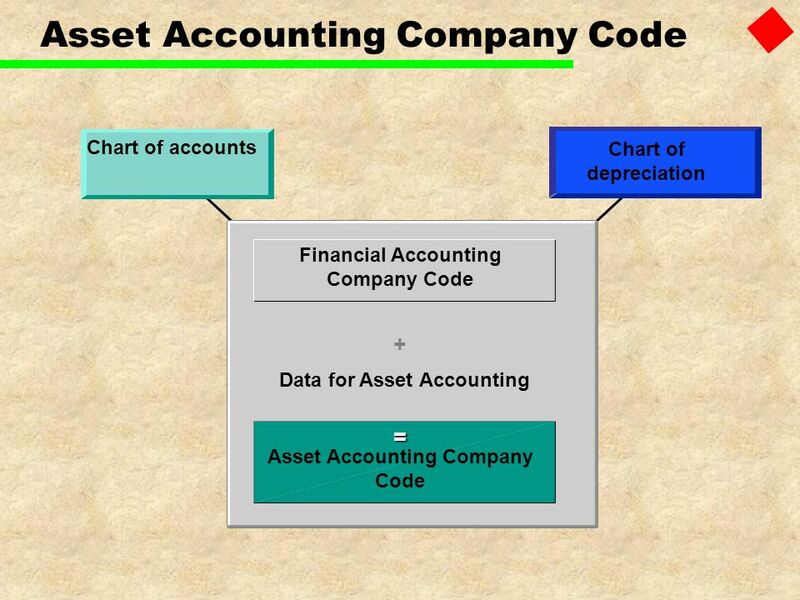 Chart of accounts Chart of depreciation Financial Accounting Company Code + Data for Asset Accounting Asset Accounting Company Code = You have to set up company codes in Financial Accounting first. 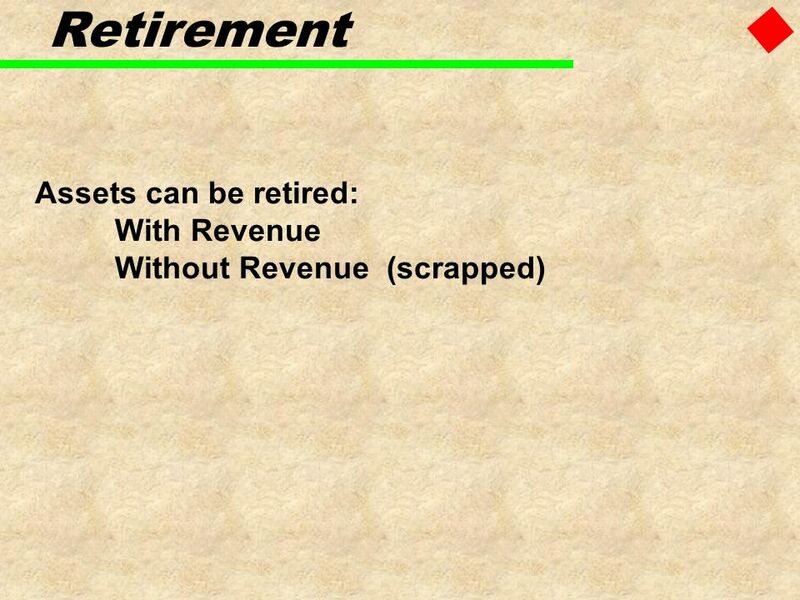 Then assign them to a chart of depreciation, and add the data necessary for Asset Accounting. 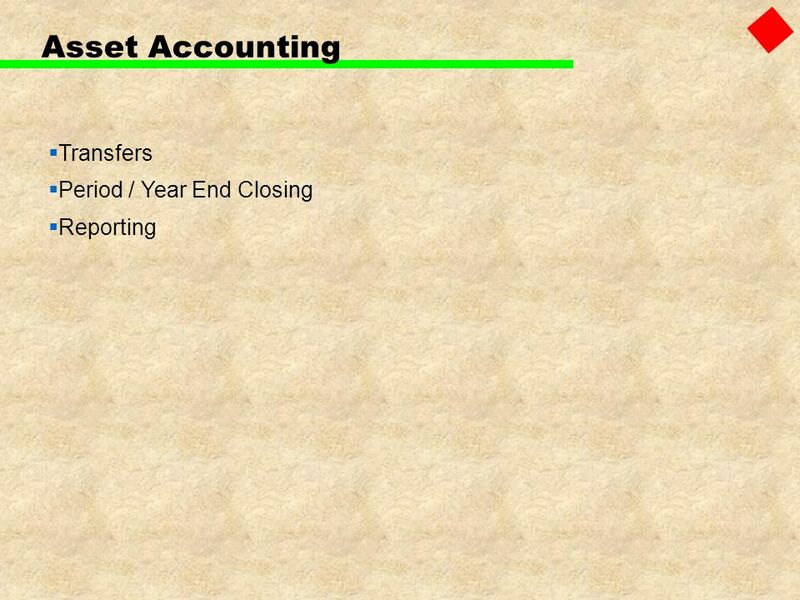 You can use the company code for Asset Accounting only after making these modifications. 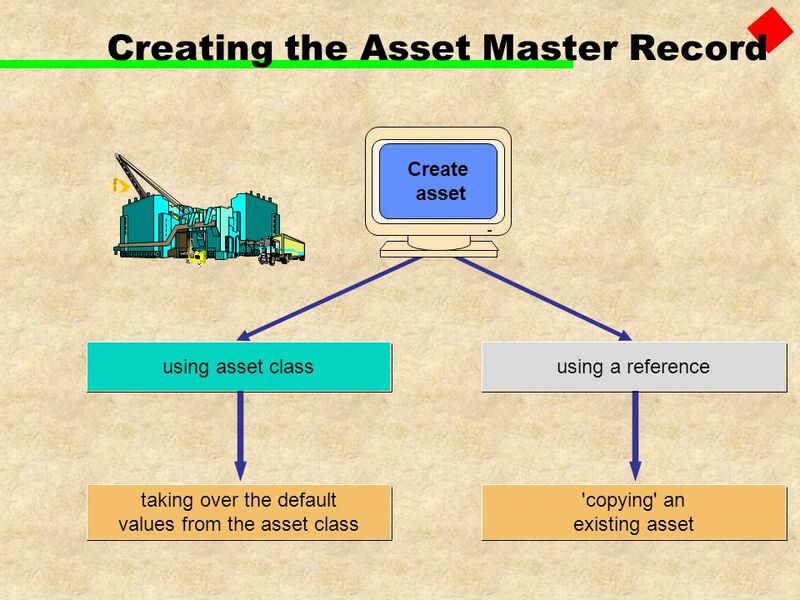 using a reference using asset class taking over the default values from the asset class 'copying' an existing asset Create asset When you create the asset master record, you have two options: You can use the asset class, to which the asset will belong, to provide default values. The asset class then supplies the most important control parameters in the asset master record. Or you can use an existing asset as a reference for creating the new asset master record. 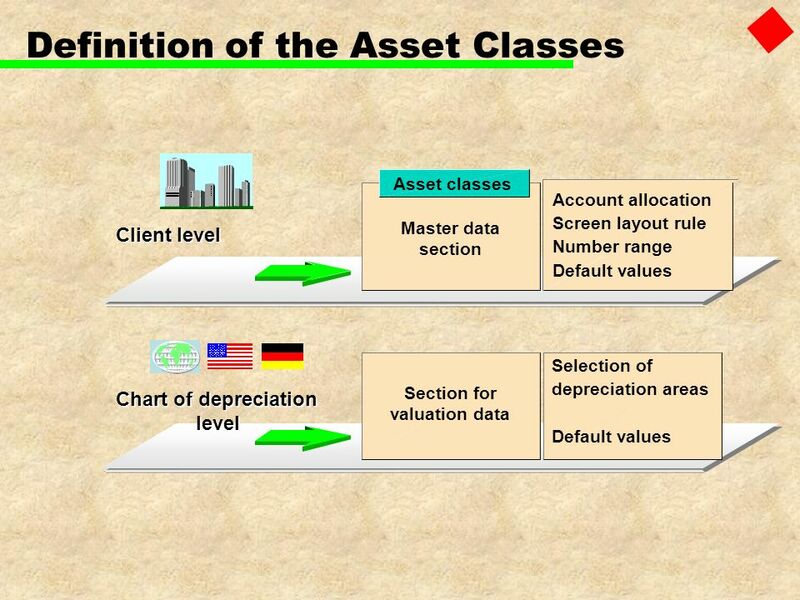 (Possibly the reference asset has default values that are more suitable than those in the asset class.) Enter additional information, such as an asset text. When you save, you receive an asset number (if the asset class is assigned to a number range that uses internal number assignment). This asset number is also the account number of the individual asset account. New Interval 01 Month Calendar Enter period under consideration Valid from	MMDDYYYY Valid to MMDDYYYY Cost center A	from	01/12/YY	to	08/27/YY Cost center B	from	08/28/YY	to 11/30/YY Cost center C	from	12/01/YY	to	03/14/YY Some information in the asset master record can be managed as time-dependent data. This is of particular significance for cost accounting assignments (for example, cost center, order, project). Shift operation and asset shutdown, both of which can have a direct effect on depreciation, should also be recorded on a monthly basis as part of this time-dependent data. The history of time-dependent assignments is stored in the system over the entire life of an asset. 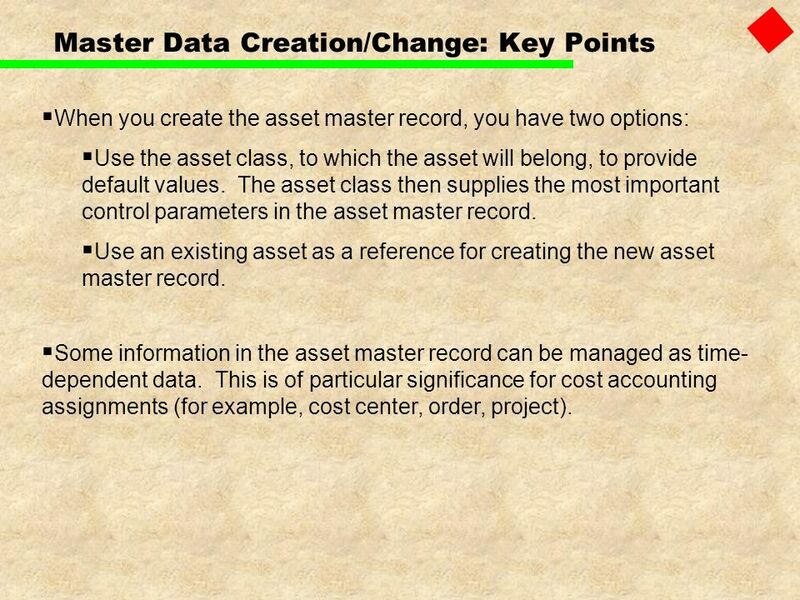 When you create the asset master record, you have two options: Use the asset class, to which the asset will belong, to provide default values. The asset class then supplies the most important control parameters in the asset master record. Use an existing asset as a reference for creating the new asset master record. 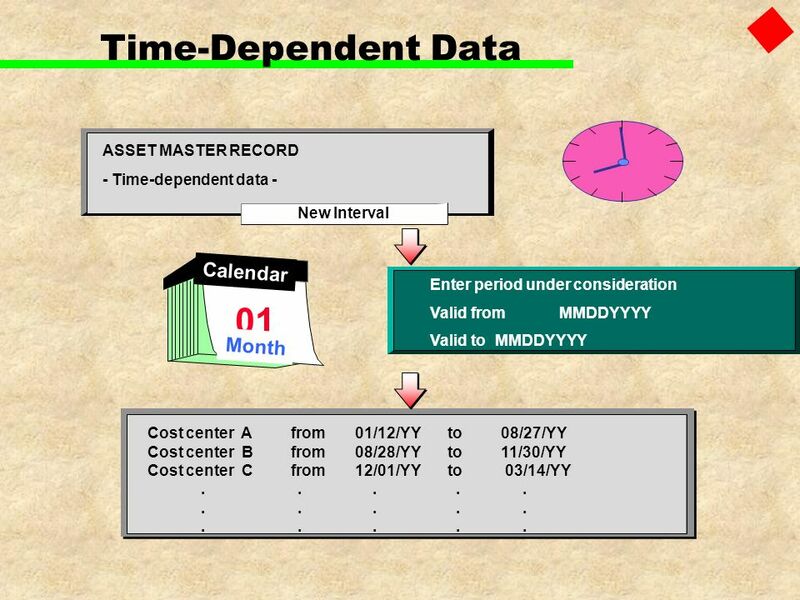 Some information in the asset master record can be managed as time-dependent data. 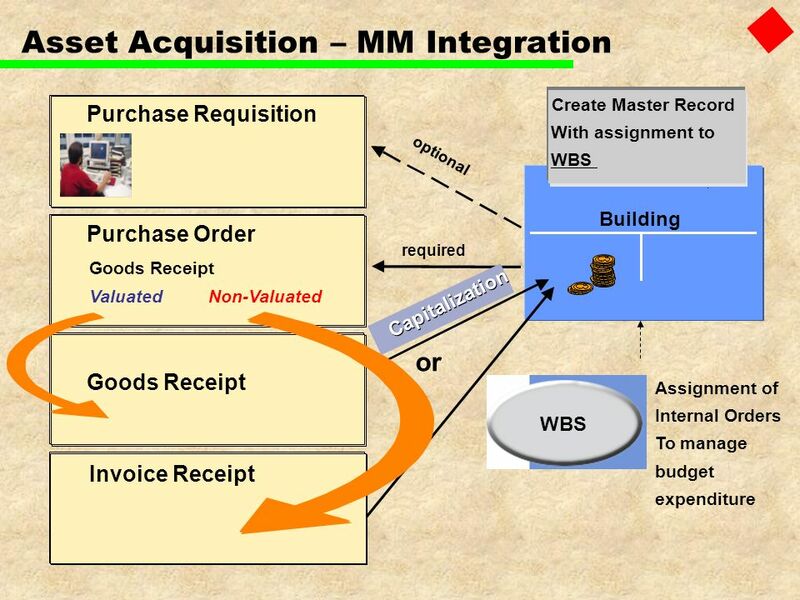 This is of particular significance for cost accounting assignments (for example, cost center, order, project). 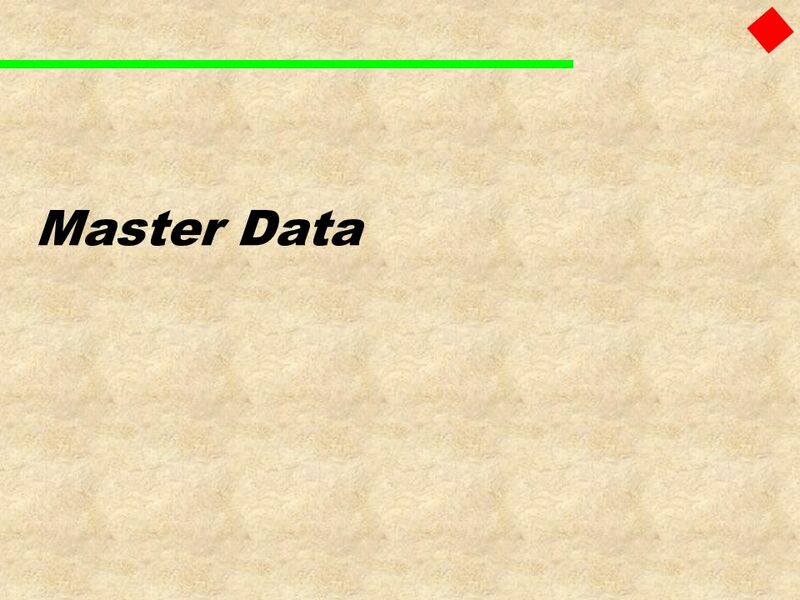 Some information in the asset master record can be managed as time-dependent data. This is of particular significance for cost accounting assignments (for example, cost center, order, project). Shift operation and asset shutdown, both of which can have a direct effect on depreciation, should also be recorded on a monthly basis as part of this time-dependent data. The history of time-dependent assignments is stored in the system over the entire life of an asset. 35 Depreciation SAP supports the following direct types of depreciation: Ordinary Depreciation: planned reduction in asset value due to normal wear and tear. 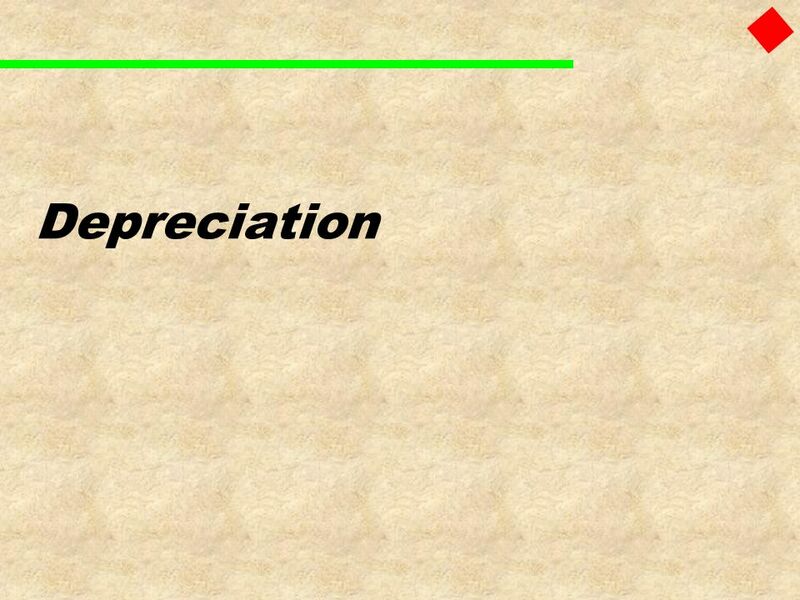 Special Depreciation: depreciation that is solely based on tax regulations. Unplanned Depreciation: depreciation resulting from unusual circumstances, such as damage to the asset, that lead to a permanent reduction in its value. 36 Depreciation Key The depreciation areas are identified in the system by a two-character numeric key. 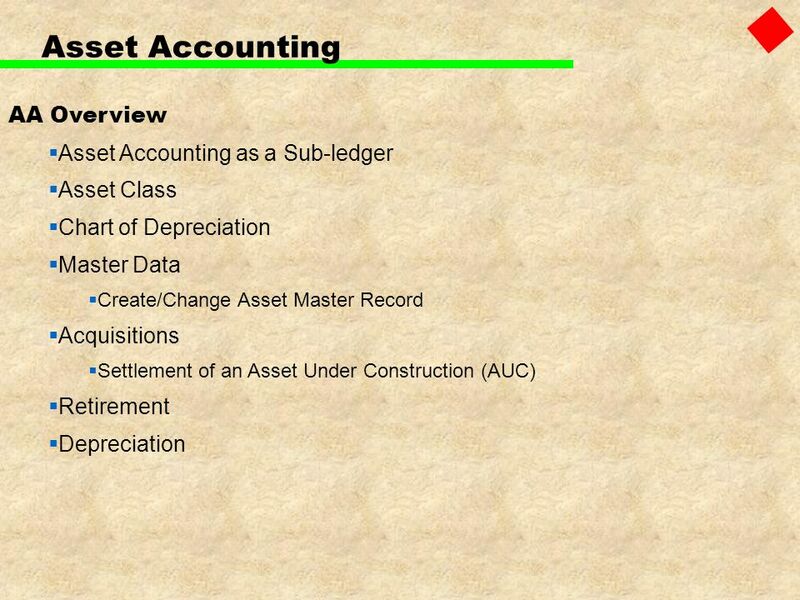 You make this specification in the asset classes, and can define it directly in the given asset master record. The system allows you to define an almost indefinite number of depreciation areas. This feature enables you to handle a large number of different types of valuation in parallel. 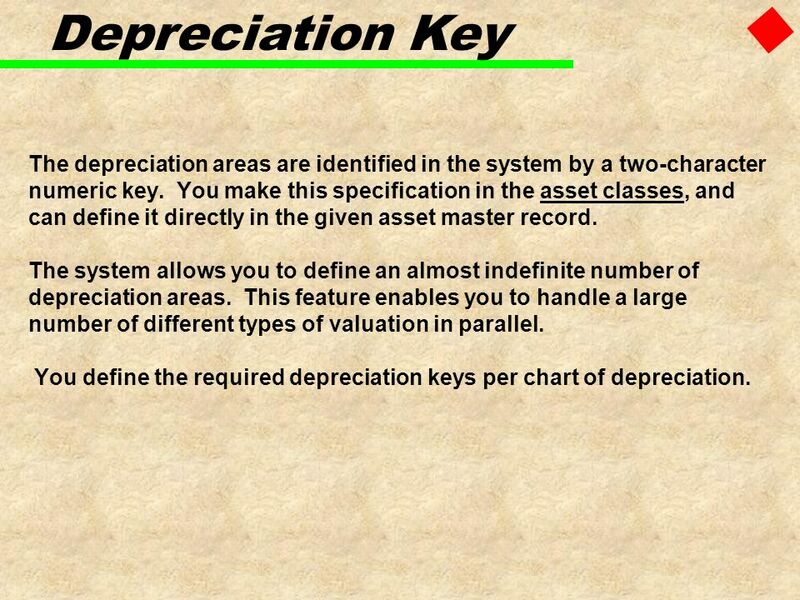 You define the required depreciation keys per chart of depreciation. 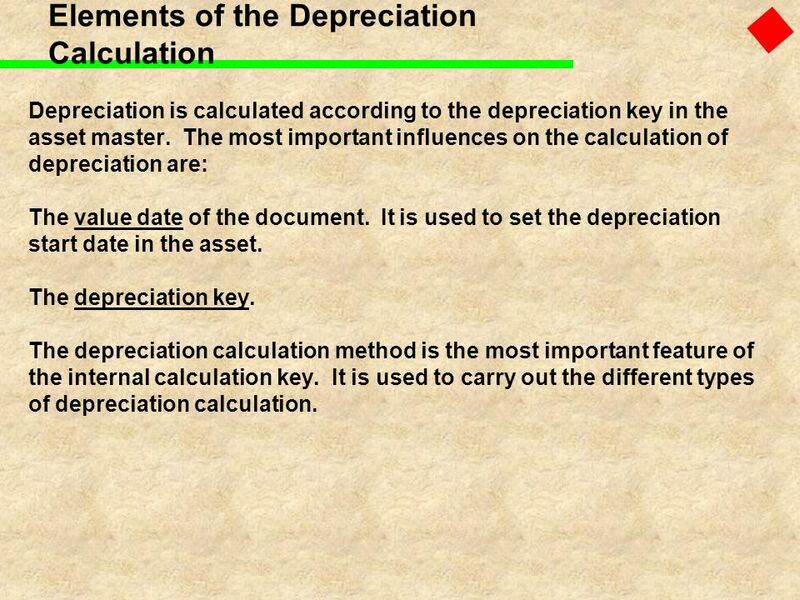 Depreciation is calculated according to the depreciation key in the asset master. 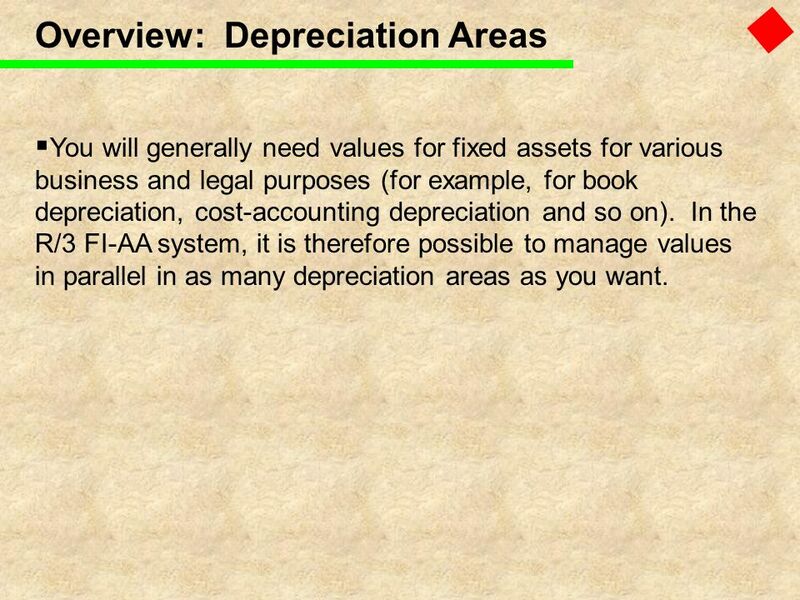 The most important influences on the calculation of depreciation are: The value date of the document. 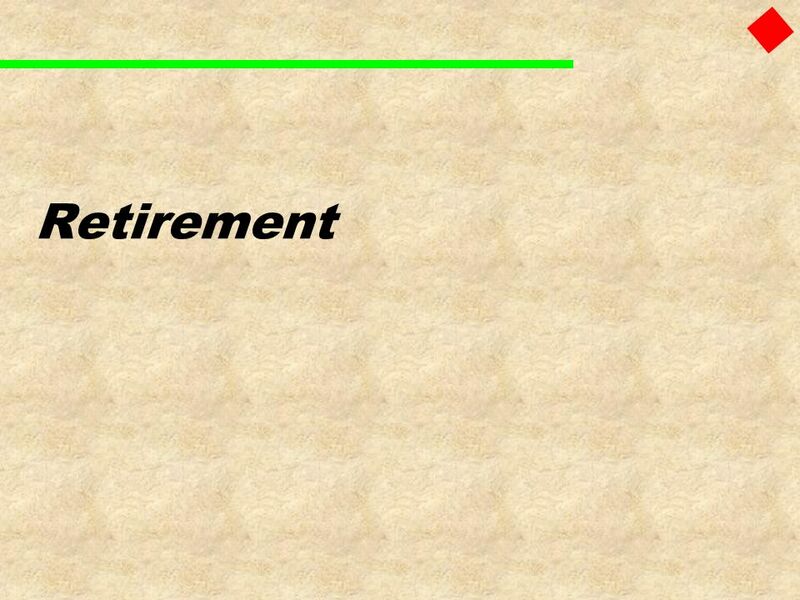 It is used to set the depreciation start date in the asset. The depreciation key. 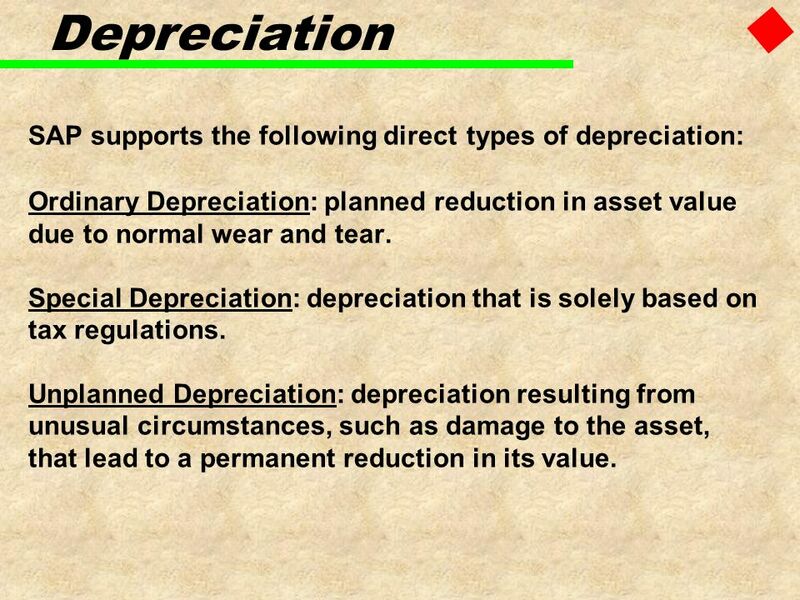 The depreciation calculation method is the most important feature of the internal calculation key. It is used to carry out the different types of depreciation calculation. 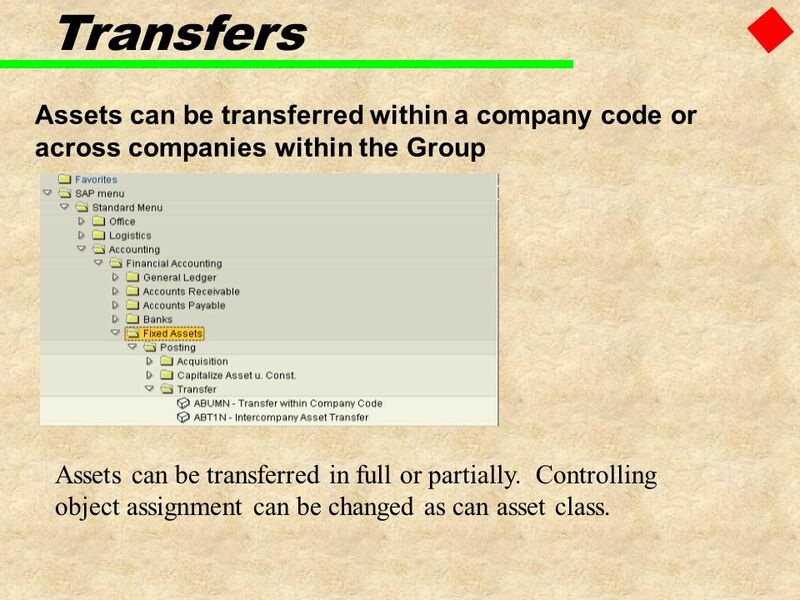 39 Transfers Assets can be transferred within a company code or across companies within the Group Assets can be transferred in full or partially. Controlling object assignment can be changed as can asset class. 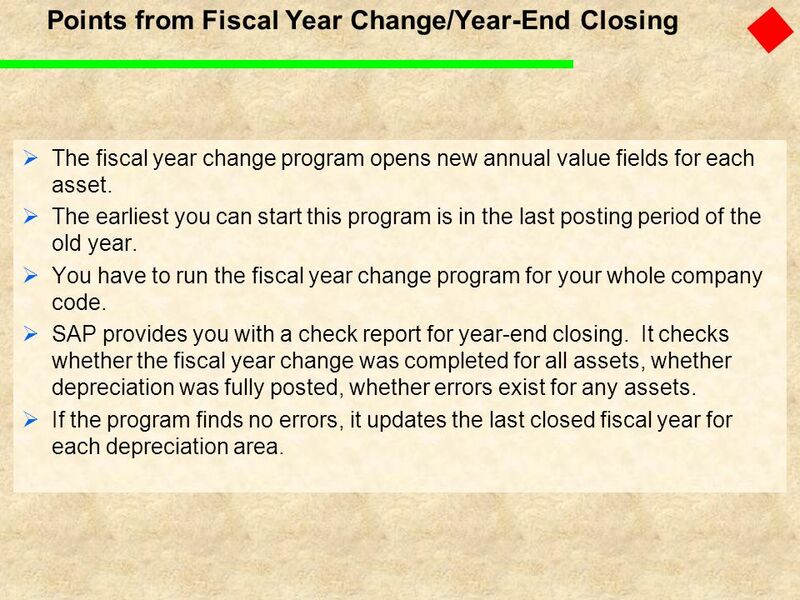 The fiscal year change program opens new annual value fields for each asset. The earliest you can start this program is in the last posting period of the old year. You have to run the fiscal year change program for your whole company code. 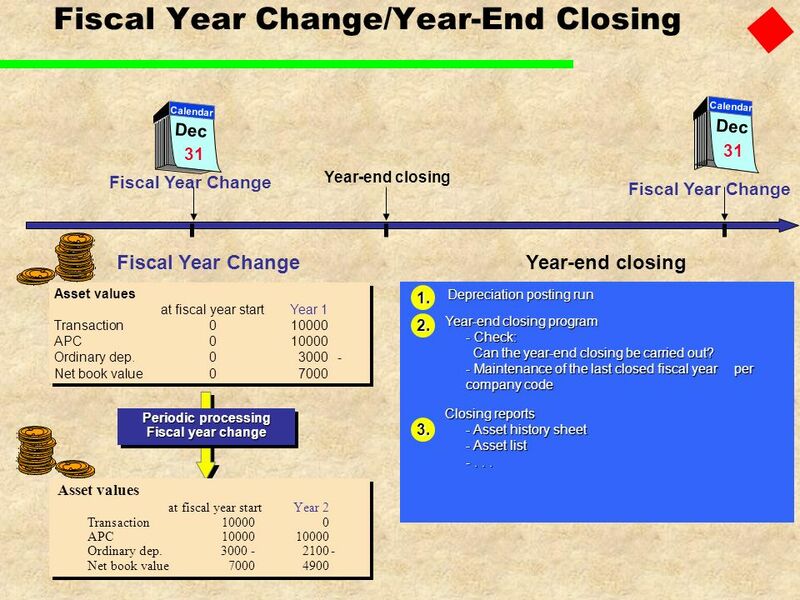 SAP provides you with a check report for year-end closing. It checks whether the fiscal year change was completed for all assets, whether depreciation was fully posted, whether errors exist for any assets. 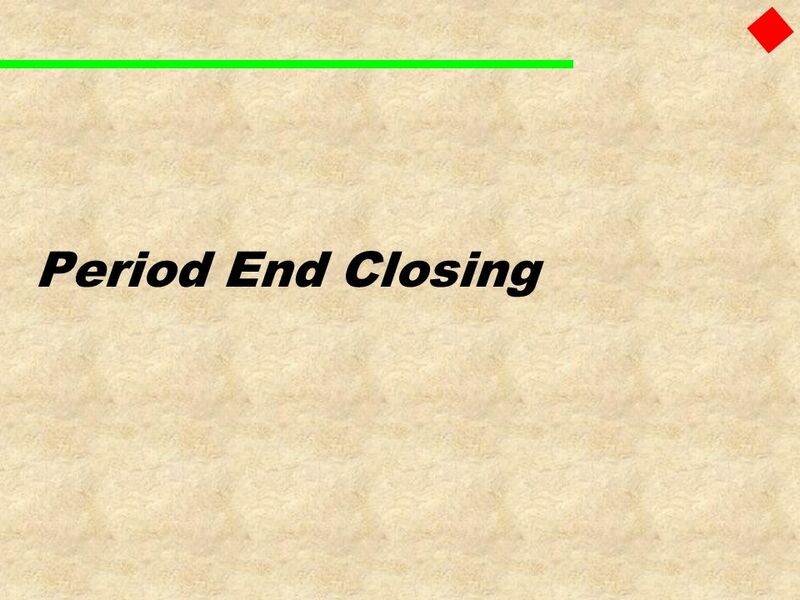 If the program finds no errors, it updates the last closed fiscal year for each depreciation area. 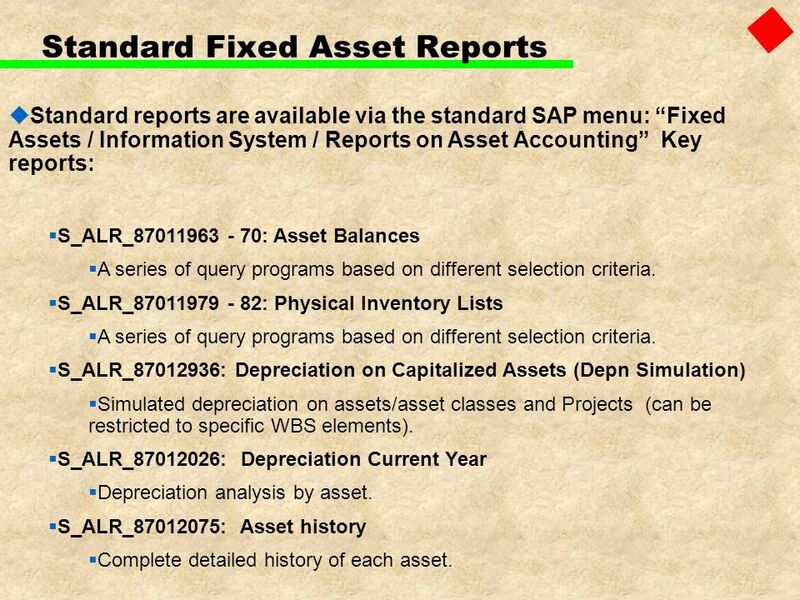 Standard reports are available via the standard SAP menu: “Fixed Assets / Information System / Reports on Asset Accounting” Key reports: S_ALR_ : Asset Balances A series of query programs based on different selection criteria. S_ALR_ : Physical Inventory Lists S_ALR_ : Depreciation on Capitalized Assets (Depn Simulation) Simulated depreciation on assets/asset classes and Projects (can be restricted to specific WBS elements). S_ALR_ : Depreciation Current Year Depreciation analysis by asset. S_ALR_ : Asset history Complete detailed history of each asset. General Ledger Fiscal Year End Closing out WELCOME! 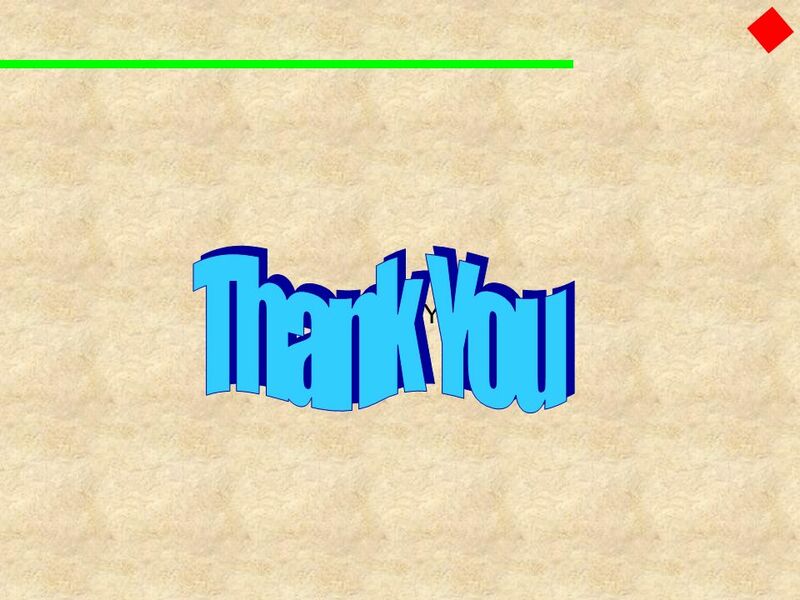 To the Year End Workshop. During this workshop and presentation, references will be made to. © 2005 myCompany General Ledger Instructor Name. 2 This course covers General Ledger Accounting in SAP, including:  General ledger account master records. Flexgen General Ledger for Beginners. Class Purpose Intended for the person who has little experience using LGC’s Flexgen Accounting software To demonstrate. 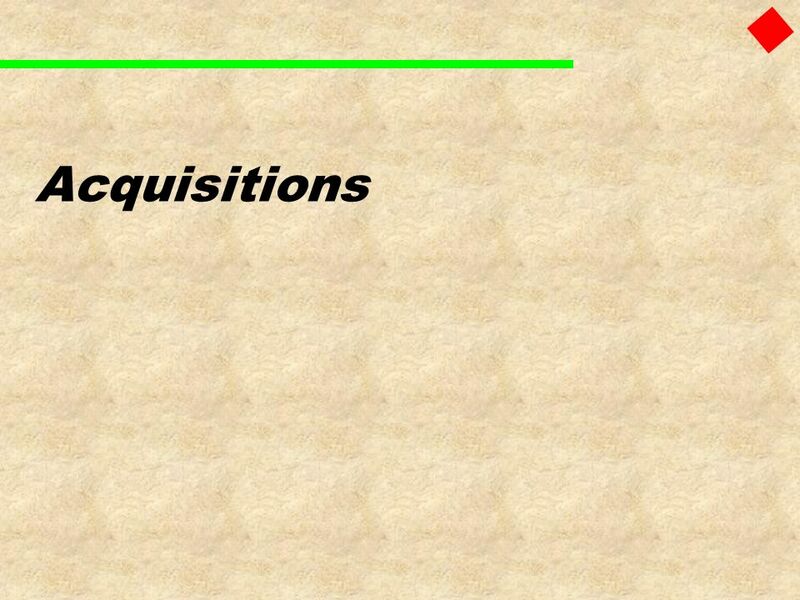 Investment holdings > 50% = Large holdings The holding company > The subsidiary. Module 6 Setup for Posting. Document  In SAP, a document is an electronic record of a business transaction  Documents are the link between the business. 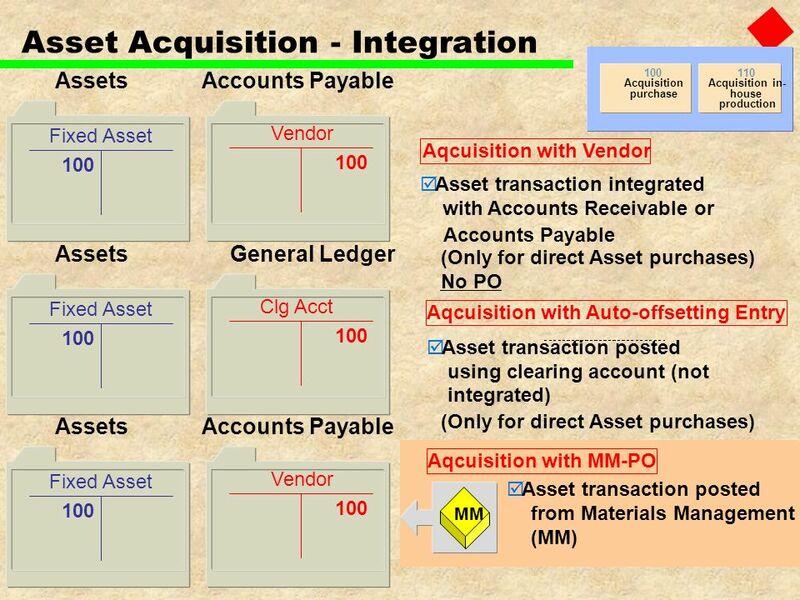 FIXED ASSETS ZETA ERP. FLOW PANEL.